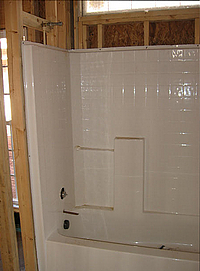 ● Install and connect prefabricated shower-tubs units (common for small baths). 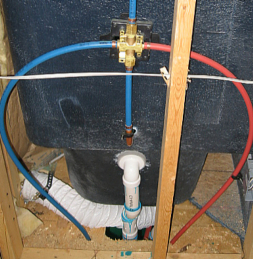 ● Provide connection materials for, and install, showers, tubs, sinks, toilets, and anything else that uses water. ● Call for inspection on each phase of his work. Your plumbing contractor will offer you a choice between two types of water lines: copper and a form of high-strength plastic known as PVC. PVC is much cheaper and more resistant to freezing. It is not considered a target for construction site thieves. 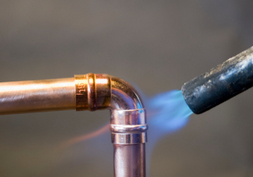 Copper water lines are soldered together and are extremely durable, offering decades of trouble free service. Copper costs more, with unpredictable price fluctuations. Copper is very definitely a target for thieves in your unfinished house. Lately, I’ve used PVC exclusively, both for cost and reducing likelihood of theft.